MyPlate is the most recent nutrition guide from the United States Department of Agriculture. Replacing the old food pyramid that was a key part of nutrition education for almost two decades, it is now the government's primary food group symbol. 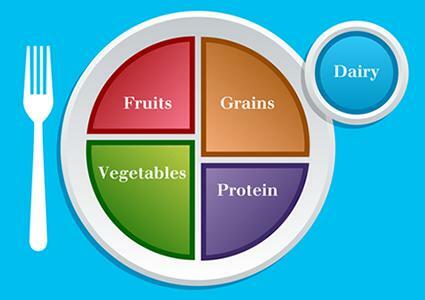 MyPlate can easily be customized for the vegetarian diet. Consisting of five food groups that are attractively illustrated on a place setting, USDA's MyPlate can help you establish and maintain healthy eating habits for a truly balanced, vegetarian diet. The size of each food group within the depiction correlates with the recommended servings from that category each person should consume per day. Unlike the old food pyramid that gave more blanket recommendations for serving sizes each day, MyPlate is detailed and specific on its serving recommendations for each age group and varies based on your level of physical activity and gender. MyPlate recommends that you get approximately 30 percent of your calories from vegetables each day. This can be any vegetable or even any 100-percent vegetable juice. Also, you don't have to shop for raw and organic foods to get your fill of vegetables. They still count towards your vegetable servings if they are raw or cooked, and you can eat your vegetables fresh as well as from the can or freezer. Dried or dehydrated vegetables totally count, too. MyPlate divides vegetables into five subgroups. The beans and peas subgroup includes soy beans, a staple for vegetarians in many forms, and split peas. Other vegetables are onions, green peppers, cucumbers, mushrooms, and beets. According to the USDA, a single cup of vegetables or vegetable juice is considered one cup from the Vegetable Group. Two cups of raw, leafy greens count as a 1-cup serving from the Vegetable Group. More simply, MyPlate revealed that an easy way to determine if you are on the right track is to make sure that half your plate is comprised of fruits and vegetables at each meal. MyPlate recommends between 1 cup to 3 cups of vegetables per day for kids, depending on their age. It recommends between 2 to 2.5 cups daily for adult women and between 2.5 to 3 cups daily for adult men. Some food pyramids for vegetarians recommend more vegetables and may even group leafy greens into a separate category. The Grains group of MyPlate includes a vast variety of foods made from oats, rice, wheat, cornmeal, barley, and any other cereal grain. There are only two subgroups: Refined Grains and Whole Grains. What separates whole grains from refined grains is the simple fact that whole grains have the entire grain kernel intact, including the germ, bran, and endosperm. MyPlate says that 30 percent of your diet should come from grains. Vegetarians should enjoy a diverse assortment of grains each and every day. They should form the foundation and base of the diet for vegetarians and omnivores alike. Pastas, breads, oatmeal, and even breakfast cereals are included in the Grains group. However, keep in mind that at least half the grains you consume should be whole grains, according to the USDA. Your age, gender, and current level of physical activity are all factors in determining how many grains servings you should eat each day. Adult women need around 3 ounces of whole grains per day. Adult men should consume 3 to 4 ounces of whole grains daily. Young children need fewer servings depending on their age and how active they are. MyPlate recommendations laid out by the USDA include a generous Protein group. Vegetarian options include processed soy products, beans, legumes, nuts, and seeds. These foods have large amounts of protein, just like meat, but they are all plant-based. Protein should be 20 percent of your daily diet. Most people get enough protein, but they need to consume a wider variety of protein-rich foods. Soy products like veggie burgers, veggie dogs, protein sandwich slices, tofu, and tempeh help vegetarians easily add more protein to their diet in a fun way. Children under the age of 8 need between 2 to 4 ounces of protein per day. Adult women need between 5 and 5.5 ounces per day, while men need between 5.5 to 6.5 ounces each day. A fourth-cup of cooked beans count as one ounce equivalent from the Protein group. The same is true for a single tablespoon of peanut butter or one egg. Whole fruit, chopped fruit, pureed fruit, and 100-percent fruit juice all are equally valid as choices within the Fruit Group. Canned, dried, frozen, and fresh fruits all count as well. Buying and eating fresh fruits that are in season can help you save money in meeting this recommendation. Fruits should make up 20 percent of your daily diet by MyPlate standards. One cup of chopped fruit is an example of a typical serving in this food group. Like all other categories, the amount that's recommended depends on a consumer's age as well as gender and activity level. A woman should eat 1.5 to 2 cups of fruit daily, while a man should have about 2 cups per day. The MyPlate Dairy food group is significantly smaller than the other food groups, and it is pictured in the glass on the place setting depiction. While not all vegetarians consume dairy products, lacto-vegetarians and lacto-ovo-vegetarians eat dairy foods and drink milk; there are plenty of substitutions within this category for vegans as well. Calcium-fortified soy milk is part of this group. Try to choose low-fat or non-fat dairy foods when possible. It's easy to get your daily recommended serving of dairy and calcium-fortified soy milk. Soy yogurts and ice creams that are fortified with calcium are tasty options. Very young children should consume 2 cups per day, while adult men and women need 3 cups per day. The USDA recommends consuming these foods only sparingly. While nearly everyone wants to indulge in sugary desserts, cooking oils and butter or margarine, don't make them part of your daily diet. Try to use these foods for flavorings or special treats only. Vegetarians and non-vegetarians should strive for balance at every meal. Try to include a variety of foods from several groups of MyPlate with each major meal you eat, and include snacks throughout the day that also meet your nutritional requirements. Vitamin B12 is an important vitamin that helps ensure proper functioning of the nervous system and the brain. Vegetarians can easily get this vitamin from milk and eggs to get the vitamin. Vegans should look into B12 supplements or multivitamins. VegNews praised the simple, straightforward design of this government guideline for nutrition. Use the information from MyPlate to get a better idea of how to plan your daily meals. It's designed to help make getting better nutrition easier.